What is Spectrophotometer or spectrometer? This page covers Spectrophotometer or spectrometer basics.It mentions features of Spectrometer from reputed vendors/manufacturers. Other vendors of Spectrophotometer are also mentioned. Definition: As we know in the field of physics, spectrometer is a instrument used to measure EM spectrum. The spectrum is a graph which has wavelength on X-axis and intensity on Y-axis. The spectrometer used in optical domain is known as spectrophotometer. It is used to measure light properties over specified range in the electro-magnetic or EM spectrum. • It is used in astronomy to analyze radiation from astronomical objects. • It is also used to determine chemical composition. 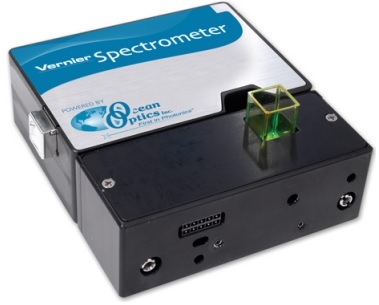 Following table mention silent features of Spectrometer from Vernier Software & Technology. Power source It can be powered using USB cable from any computing devices such as PCs, laptops etc. • JINAN PRECISION TESTING EQUIPMENT CO.,LTD, spectrophotometers model V-5000, UV-5200/5300/5500 etc.